A fundraising tool that supports your local community. 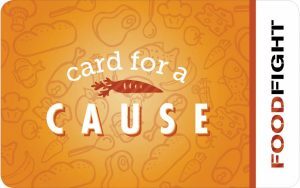 Cards for a Cause is a gift card program developed by Food Fight Restaurant Group as a way to help local charities raise funds, all while keeping those dollars local. organization linked to that code. Learn more here.